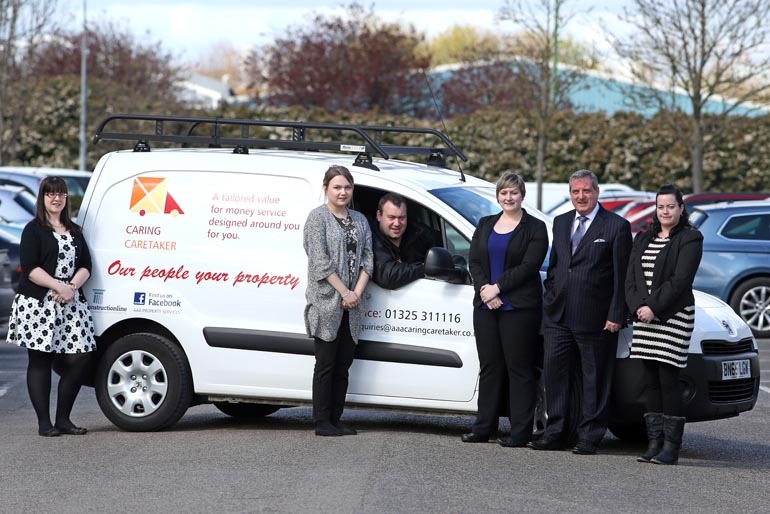 AAA Caring Caretaker does exactly what it says on the tin – and when you get an insight into this family firm, you can see it’s living up to its name. 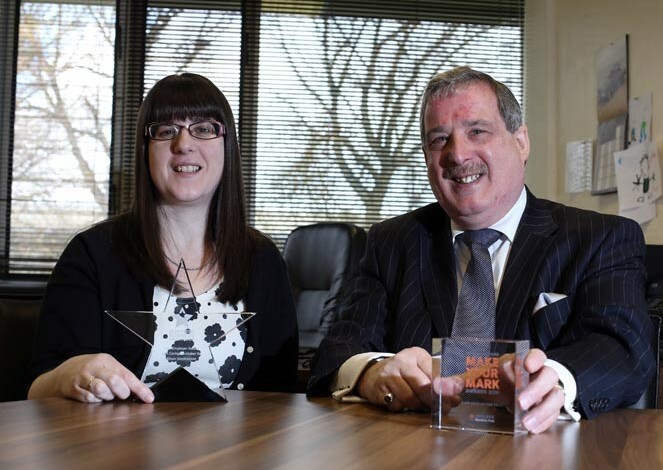 Winners of the Employer of the Year category at Aycliffe Business Park’s Make Your Mark awards back in February, Caring Caretaker followed that accolade up by winning the same award at the Northern Business Star regional awards event in Newcastle in April. The company – run by father-and-daughter team Richard Tucker and Alison Stephenson – forms part of a group of five businesses based at Bede House along St Cuthbert’s Way on Aycliffe Business Park. It was first launched as AAA Property North East in Sedgefield in 2007 and first relocated to Aycliffe in August 2014, at St Cuthbert’s House. AAA Caring Caretaker was then launched in January 2015 and in August last year the firm had to expand into larger offices at Bede House. It now has contracts with the NHS, Poundstretcher, Flexspace and a number of large care homes and estate agents as well as countless private landlords which is seeing the firm flourish. With 10 members of staff, including three maintenance technicians who are out on the road, it’s the firm’s refreshing approach to recruitment, as well as staff benefits, which has made competition judges stand up and notice. “To win Employer of the Year really personified everything we’re trying to do,” says Richard proudly. “Of all the awards, that one really made the point of what we’re all about – caring for our clients, but caring for our staff, too. Richard has 25 years’ management experience operating at middle and senior management levels within large corporate firms, and he’d previously spent 20 years within the RAF Transport and Logistics command which included spells in the Falklands and the first Gulf War. He then transferred his skills into managing commercial areas of logistics supply chains, distribution, production, transport, warehousing and inventory for firms including Safeway, Virgin Tie and TDG. Richard then launched AAA Property North East when he bought a portfolio of properties with his third redundancy, and has quickly developed the group of firms all based in Aycliffe. “I started out just maintaining my own properties myself,” he explains. “Then in 2009 Durham University offered us a project to find host families for Norwegian students. “Alison then joined me as operations director and we formed AAA Host Families in 2010. Since then Alison has developed that side of the business. “We now house more than 100 students a year and we have contracts with Norwegian, Danish and French governments. “At the same time our property and management businesses continued to grow and there was a light bulb moment, during a meeting with the RAF, when we were discussing how we were going to deal with the next tranche of people coming out of the services, we then thought up Caring Caretaker and looked to take on ex-servicemen as well as other people. “If the right candidate is found, then we will work around any needs they may have to support them getting back into work. Ex-servicemen are already vetted CRB-checked and they came with a work ethos and high morale. They want to be given a chance, they want to work and they want to please their employers. “We also work with other programmes, such as Groundworks, in getting people back into work. Alison also says they spotted an opportunity to launch Caring Caretaker which would benefit their clients. “We wanted to create a one-stop-shop, because we found a lot of landlords would often have a lot of minor repairs,” she added. “They’ll get an electrician to fix their lights but he won’t look at the sink, for example, because that’s a plumber’s job. Caring Caretaker is now looking to take on more staff, and hopes to recruit some apprentices soon. “The guys we already have are perfect,” said Alison. “So in an ideal world we want to clone them! Alison has been the driving force behind Caring Caretaker’s philosophy of looking after staff. She has more than 12 years’ of teaching experience and eight years in project management, and is trained in equality and diversity. She also delivers deaf awareness and British sign language courses to a range of businesses, giving them tips on how to be more accessible to deaf clients and employees – one of which has since won an award for equality and diversity. And they practice what they preach. “We give people opportunities and we try to make working life enjoyable and we adapt the workplace to suit the needs of our staff,” says Alison. “We have one who has a sever nut allergy, a serious allergy which could kill her, and she used to be ridiculed and bullied about it in her previous employment because they didn’t take it seriously. But we’ve made our offices a complete nut-free zone, and that’s not up for negotiation. “We have two members of staff with dyslexia, but we’ve given one of them a dictaphone so they can read out their reports and another member of the team will type it up. “We see people for who they are and what they can offer us, rather than whatever limitations they might have. “We also offer training to our staff – we have five members of the team doing NVQ training at the moment – and we took a young lady in from the Princes Trust scheme, put her on an NVQ and she’s about to finish her first qualification, which will give her a major boost. As well as their Employer of the Year awards, Caring Caretaker was also 2015 finalists in the Durham Student Landlord of the Year and North East Property Manager of the Year categories at the North East Student Housing awards. But winning the top awards recently was just reward for a lot of hard work. “It felt like a virtual pat on the back,” added Alison. “It was nice to be made to feel special for one night, because a lot of hours, a lot of hard work, a lot of blood, sweat and tears goes into running the businesses here and that special night makes it all worthwhile. • For more information about AAA Caring Caretaker, go to www.aaapropertynortheast.com or call 01325 311116.